Crush 115g Waitrose Digestive Biscuits and mix in a bowl with 50g melted butter. Spread over the base of an oiled 20cm springform cake tin. Place in the fridge for 10 minutes until set. In a bowl, mix 2 x 200g packs Waitrose Soft Cheese, the yolks of 2 large eggs, 75g caster sugar and 1 tsp vanilla essence. In another bowl, whisk the whites of the eggs to form soft peaks. Fold into the cheese mixture. Pour over the biscuit base, smooth the top and bake in a preheated oven, 180°C, gas mark 4, for 30-40 minutes, until just set. Remove and set aside for 15 minutes. Mix a 284ml pot Waitrose Soured Cream and 25g caster sugar. Spread over and return to the oven for 5-10 minutes until set. Cool in the tin, then chill for 6 hours. Remove from the tin and place on a serving dish. 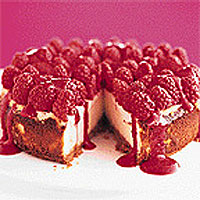 Arrange 2 x 150g punnets of raspberries on top and drizzle with a 160g bottle of coulis de framboise.